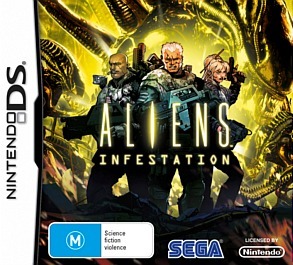 Based on the James Cameron (Avatar, Titanic) Alien and Aliens movie series, Aliens Infestation on the Nintendo DS allows gamers to lead their own hunt against the deadly xenomorphs. 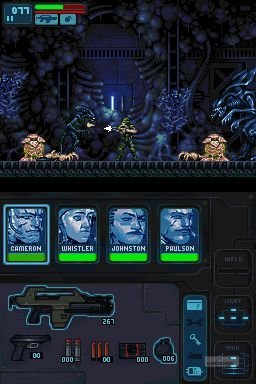 Inspired by the films, you will visit authentic locales such as Sulaco and LV-426 as you engage with your Colonial Marines in this side scrolling game that is also reminiscent of the excellent Metroid series. As you search these areas, missions are generally a search and destroy tactic with the odd NPC thrown in here and there plus stealth is sometimes a key to victory. The game begins on the USS Sulaco with four marines which drops the gamer into the universe of Aliens from its environments (graphics) and the awesome sound effects, especially that ever scary motion tracker sound that detects the xenomorphs. Just like Newt from Aliens, they mostly come out at night... mostly and before you know it, you're gripping your pulse rifle and firing at these never ending hoard of aliens. In terms of your small marine corp, you will find your favourite marines that you try to protect more than the others but sometimes this is difficult in the heat of the battle. If they do die, you do find new recruits littered through the various environments and there is a total of around 20 who can join your crew. However, nothing is more fun than trying to save your party members when they have been captured. Because we all know what happens when an Alien sits on a human! The difficulty of Aliens Infestation can be quite challenging at times, especially the sometimes long distances between save points which will have you swearing like the folks from good old Aliens the movie. Once you do reach a save point, it's definitely an elated feeling of happiness and relief. 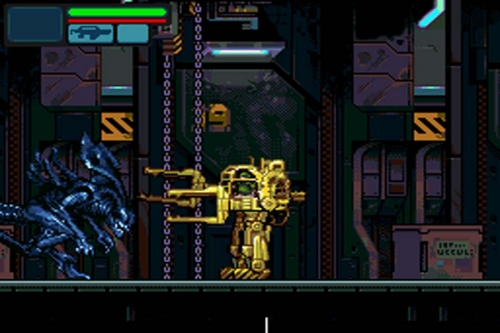 Enemies are based on the films from soldier xenomorphs that just hunt to deadly boss battles of gigantic aliens that are sometimes quite tricky to defeat. The scariest aliens are the face huggers which are small, numerous and fast. Enemies are generally quite dub yet quite powerful and if you stay in the same location too long, they respawn which does increase the anxiety for the player. Another issue is that you're also limited to ammunition, so you need to be quite pedantic in conserving ammo. Running plays a key strategy to the game as well because you do need to run to save your own bacon and then to compound things, you have a stamina metre. There is even a cover system employed into the game and surprisingly it works quite well, especially when you duck and fire. But when in doubt, running helps. To help you with your plea, you will find weapon upgrades littered through the environment and thankfully all the weapons are based on the movies because they are so cool to use such as the pulse rifle or the flamethrower. Apart from upgrades and health, there are plenty more references to the movie littered through the game and there's some cool mini-games. For example, like Bishop, the android from Aliens, you get to perform that famous knife trick where he placed a marine's hand on the table, his on top, and then put a knife between each finger at super speeds. Another cool trick is to weld doors shut to prevent the aliens from bursting through. With that said, the bottom screen of the DS is used for your party statistics and navigating your weapons and ammunition etc. Thankfully the touch screen is used sparingly but overall, this is one well made and fun game. 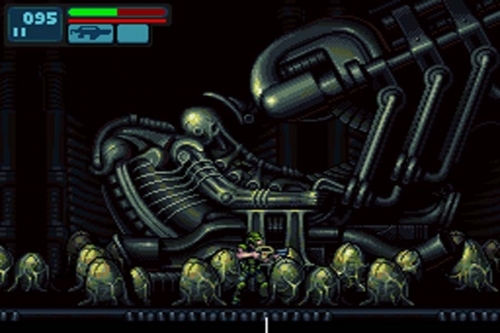 Graphically, Aliens Infestation is one of the coolest looking movie games on the DS and even though it's all sprites that harken back to a simpler time, it certainly pays homage to the Alien movies. It should also be noted that the 20 or so marines that you encounter have been designed by comic artist Chris Bachalo who gives them their own personalities. Needless to say, I enjoyed these 80's inspired sprite graphics. The soundtrack is quite eerie and when the action heats up, so does the music, so I would recommend a set of headphones to enjoy the title. Sound effects go hand in hand with the gameplay to enhance the overall Aliens experience, especially the ticks of the motion tracker, the pulse sound of the rifles and those squeals of aliens. 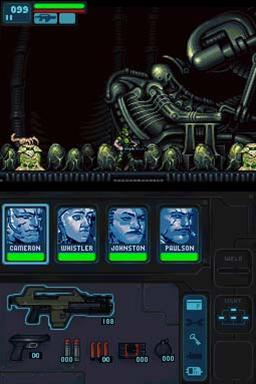 In the end, SEGA have created a very cool arcade game based on the Alien universe and this side-scrolling title with elements of Metroid works very well on the DS. I wish this was a 3DS title because it was so much fun to play but best of all, you can play this title again, thanks to the dynamic story which is effected by your recruitment choices and slightly changes the overall gameplay direction.